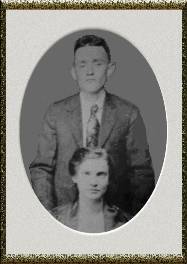 This branch of the Riley Family Tree is descended from the Rileys that arrived in Virginia in the late 1600s. They migrated west to the eastern slope of the Appalachian Mountains and settled in the Holstein River Valley the area that is now Russell Co. Virginia. They remained there until the early 1800s. In about 1803 "Patrick"and two of his Sons "Patrick Jr.and James" crossed the Cumberland Mountains into Kentucky. They settled on Middle Fork of Kentucky River in what is now Breathitt Co.Kentucky. Their descendants can still be found in southeast Kentucky but, many of then left Kentucky after the Civil War and again in the 1930-40s and can be found living throughout the United States. In memory of Add and Ellen Riley Their bodies are buried in peace, but their name liveth for evermore. The information on these pages has been compiled from many sources therefore I cannot guarantee it's complete accuracy. I am posting the information that I have compiled with the hope that it will be of help to other researchers. If you find one of your Ancestors here and have information to add or a correction feel free to contact me. If you would like to add to this database you can use this Family Group Form to submit your information. Thanks to all the family members who have contributed to the Database.